The results of studies of the characteristics of contacts with Schottky barriers on a pseudomorphic AlGaAs/InGaAs heterostructure are presented. The Ti-based Schottky diodes were created by a standard pHEMT technology. It is shown that the parameters of the fabricated contacts with Schottky barriers are close to the characteristics of ideal contacts based on aluminum or molybdenum created in the process of molecular beam epitaxy. It is also shown that as compared to the diodes based on AlGaAs homostructures, the measured Schottky barrier height is smaller and the ideality factor is higher in diodes created on pseudomorphic heterostructures. Along with the well-known methods for determining the Schottky-barrier height, we tested a technique based on the measurement of the threshold voltage in diodes with a two-dimensional electron gas. Translated from Izvestiya Vysshikh Uchebnykh Zavedenii, Fizika, No. 12, pp. 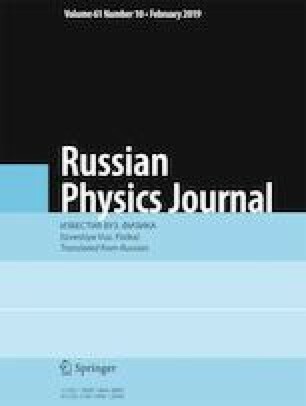 14–20, December, 2018.
http://www.ioffe.ru/NSM Archive Aluminium Gallium Arsenide (AlGaAs)-Band Structure and Carrier Concentration.